4-Word Review: She can’t remember anything. Alex (Jane Fonda) is an out of work actress and alcoholic who is prone to black outs. One morning she wakes up to the find that the man lying beside her has been murdered. She isn’t sure if she did it or not as she can’t remember anything. She cleans up the place and then by chance meets Turner (Jeff Bridges) a former cop who tries to help her prove her innocence. Starting out right away with her waking up to find the dead body doesn’t work. Some background to the character would have been better as without it the viewer doesn’t particularly care about the character’s predicament. It took me a long while before I could get into it and even then it was only at a lukewarm level. The laid-back and melodic jazz soundtrack doesn’t help. For a thriller it is completely out-of-place and as good as a director as Sidney Lumet is he seems to have problem in that area as the musical score selected for Family Business another film that he did was also a terrible choice. The film has one interesting twist near the middle, but the pacing is so slow that whatever intrigue it gave me quickly subsided, which is the film’s biggest problem. It doesn’t know if it wants to be a thriller, mystery, drama, or love story. Too much time is spent dealing with Alex’s budding relationship with Turner, which isn’t interesting. By the time they do get back to the mystery you really don’t care anymore. There are also not enough suspects and I had figured out who the culprit was long before the revelation comes about. Fonda is competent particularly in a teary-eyed emotional sequence where she tries to somehow justify her pathetic self-destructive existence. The character though is unappealing and it may take a while for the viewer to warm up to her if at all. I did like her in the blonde, puffy 80’s hairstyle, but at the half way mark she changes back to her more natural brunette look, which I felt made her look older. Bridges character helps stabilize Fonda’s and in that regards his presence is helpful, but having them meet by complete chance and then having him get so involved in her quandary seemed implausible. It would have been better and made more sense had he been a longtime friend who she turned to in her time of crisis. Although Raul Julia has a less screen time he still adds a lot more energy than Bridges. Kathy Bates, Bruce Vilanch, and Frances Bergen (Candice’s Mom) can all be seen in brief bits. I also want to mention Richard Foronjy who nails the caricature of a streetwise big city cop perfectly. Although the film is now 27 years old it really isn’t too dated. Only two issues in this area come to mind. One is when Alex can’t get any money out of the bank because it is closed due to a holiday and there doesn’t seem to be any such thing as ATM machines. Another occurs when a police investigator asks the Raul Julia character if he is gay by using a derogatory term, which wouldn’t go over today. However, Julia’s comeback line “How bad do you want to know?” is a good one. 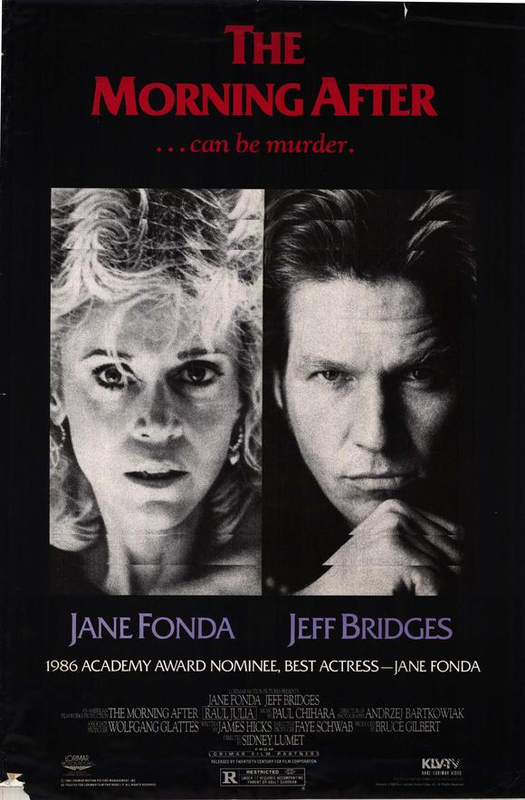 This entry was posted in 80's Movies, Drama, Mystery, Romance, Thrillers/Suspense and tagged Entertainment, Jane Fonda, Jeff Bridges, Movies, Raul Julia, Review, Sidney Lumet. Bookmark the permalink.